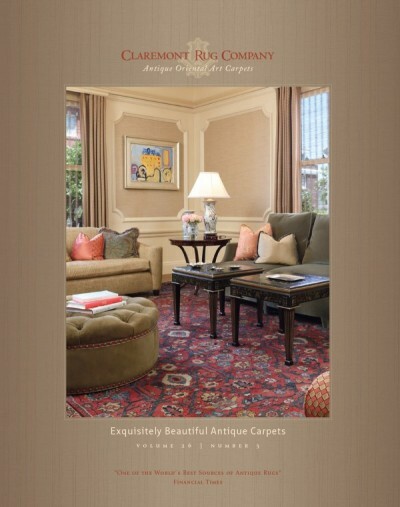 Claremont Rug Company today released its 76th catalog, which features antique rugs from the Second Golden Age of Persian Weaving in a wide range of contemporary settings ranging from a loft in Brooklyn to a family compound in Big Sky, Montana. Twelve distinctive rooms furnished with collector-caliber antique rugs in homes from across the U.S. are featured. While antique Oriental rugs are increasingly being incorporated into homes as wall art as well as in private art collections, there is a growing interest among homeowners with modern decors and contemporary art to create personal statements by juxtaposing rugs that are more than a century old with furniture and other art that is of much more recent vintage. “One of the more fascinating aspects of our new catalog is that it allows people to take a peek into the homes of private collectors and to better understand how antique rugs can make an emotional statement or become a dramatic design element to a decor,” said Winitz, author of The Guide to Purchasing an Oriental Rug. Among the distinguishing characteristics of the antique Persian and Caucasian rugs featured in this catalog from the Second Golden Age of Weaving are their use of substantially more innovative and fascinating pattern language than in younger rugs, along with the rare, exotic hues of colors stemming from natural dye recipes that have been lost with the passage of time. Claremont provides the brochure at no charge to clients and for $25 to interested parties who may order a copy here or by calling 1-800-441-1332. Four strongly collectible 19th century Caucasian rugs of great interest to longtime collectors.